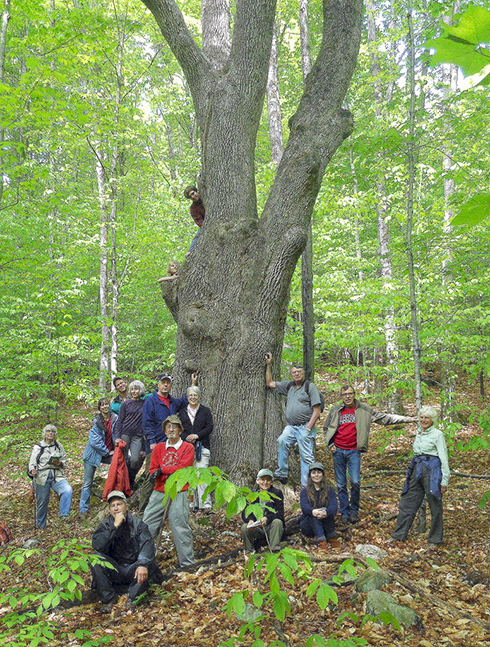 Many of the oaks, pines, and other trees on the WHPA Reserve are well over 50 feet tall (and elsewhere in the world various species of trees can readily attain staggering heights of over 300 feet). In order for the leaves to do their job of synthesizing food for the tree they require not only access to sunlight and the carbon dioxide contained in the air that surrounds them, but also a steady supply of large amounts of water — indeed, as much as 50 gallons a day. So the two-part question arises of: (a) how our trees are able to take in so much water from the soil; and (b) to then get it all the way up the trunk to the leaves far above. Uptake of the water: A tree's root system (constituting perhaps one-third of its total biomass) has a two-fold job, on the one hand to anchor the tree in place and hold it up, and on the other to take in sufficient amounts of water (together with its dissolved mineral nutrients). It does the first job well, but is simply not up to the task to accomplish the second one. But that problem has been solved through the establishment of a continuing partnership of the tree with a fungus. The fungus inhabits the root cells and sends out into the soil large numbers of hairs (hyphae), an action that extends the water-absorbing ability of the tree by a factor of as much as one-hundred fold. The fungus in turn (not being able to manufacture its own food) takes in perhaps 20% of the food being made by the tree's green leaves. This necessary and mutually beneficial (symbiotic) partnership is referred to as a mycorrhizal relationship. Moreover, the fungus very nicely benefits the tree in such additional ways as warding off pathogenic fungi, impeding the intake of toxic substances, and somehow even making the tree roots more tolerant of high temperatures. Ascent of the water: A tree has two distinct exceedingly small-bore plumbing (vascular) systems in its trunk. The first is in the outermost layers of the already dead wood (the xylem), which serves to get the water up from the roots to the leaves. And the second is in the innermost layers of the still live bark (the phloem), which serves to move the food (carbohydrates) manufactured in the leaves throughout the tree. The water within each tiny pipe forms a continuous column from bottom to top. A molecule of water when confined in a very narrow tube attaches to the next molecule above it with enormous tenacity, the tensile strength of the resulting water column actually exceeding that of a steel wire of same diameter. So when a water molecule evaporates (transpires) out through a leaf pore (stoma) it pulls up the water molecule below it, which does likewise to the water molecule below it, thence all the way down the stem and into the roots. During those times when evaporation (transpiration) from the leaves occurs the mycorrhizal system pulls in water passively — and, voila, perhaps counter-intuitively resulting in the ascent of the water via mass flow up even the tallest of tree stems. Thus, ascent of the water occurs as an unbroken "soil-fungus-root-stem-leaf-atmosphere" continuum.